Welcome back to the JekLog blog. I am back with another post related to the Jekyll blogs. We all know that the search engine traffic is most amazing traffic that one can get on your content. The traffic generated using search engine optimisation tools( SEO tools) will provide you the traffic which is more sustainable and will increase your leads too. Talking about SEO is like talking about Google, as we all know that Google is the most important search engine out there. Google has its own criteria for working. It keeps on making its algorithms stronger and stronger so that less black hat search engine optimizers can get the traffic through there channels. Getting search engine traffic by doing SEO in 2018 is the second name of producing good content. As we all know, for SEO in 2018: Content is the king. Producing great and shareable content is the basic demand for the search engines in 2018. In this article, we will discuss the most obvious search engine optimizations that we could do to make our content search engine friendly and shareable as well. 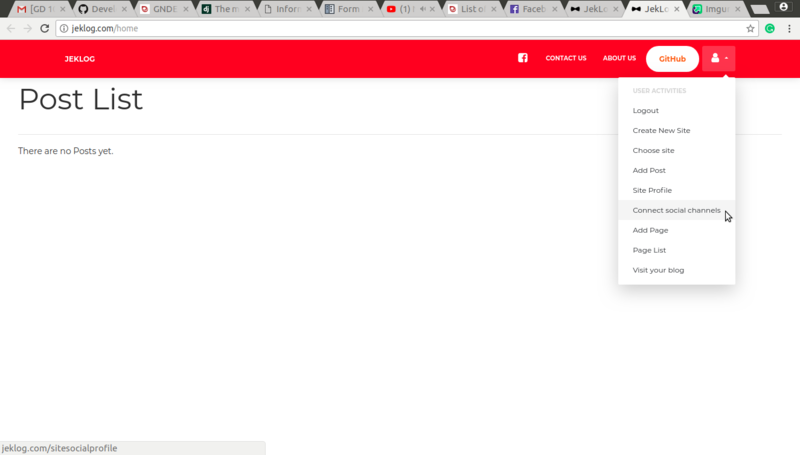 I hope you guys have read my earlier posts on How to create a blog using JekLog and have created a Jekyll blog using that guide. After that, you should also have gone through the second post i.e. How to create the first post on JekLog blog. In the beginning, search engine traffic is like nowhere near your blog. You will find that no one will come to your blog and nobody will worry about what you have to say in your first few posts. But as soon as the search engines start seeing that the following address is generating new content each and every day, they will start looking for your content. For this reason, you need to produce content every now and then in the beginning. In the process, you need to maintain the frequency. The Google crawlers and spiders have become very advanced and they can read your consistent behaviour and will definitely award you for this by indexing your website as quickly as possible. Google bots have a lot to do, so when you first ask google to index your website, it takes some time to set up everything on your website. 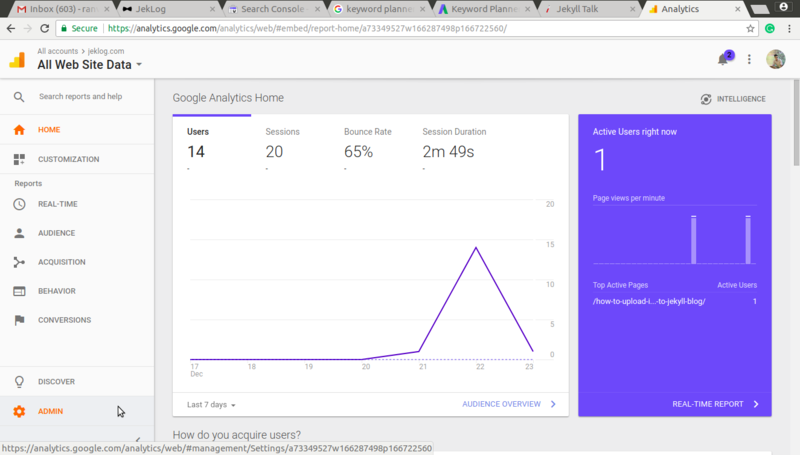 In the meantime, you can publish a lot on your blog and get indexed for a whole lot of keywords and generate a lot of traffic. Social media is the great source of generating search engine traffic to the content. This is because the page rank of the websites like facebook, google plus, twitter and many other is much higher than any other websites out there. So when you talk about your content on the social media, the posts get indexed to the search engines too. This is a great way to get the easy search engine traffic. Also, you can share your content with friends on social media, who further can share the content with there friends. This way you can make your content viral generating leads from both social media and search engines. This is a great SEO technique shared by a lot of gurus out there and still, nobody is trying to use it properly. I have already published a good length blog in my earlier posts in which I talked about the importance of the images in the SEO. Images are the great SEO tools. You can get indexed for your images in search engines by taking care of the following two things. Name your images properly ( 1.png is not a good name, flower.png is better). Make use of alt tag. 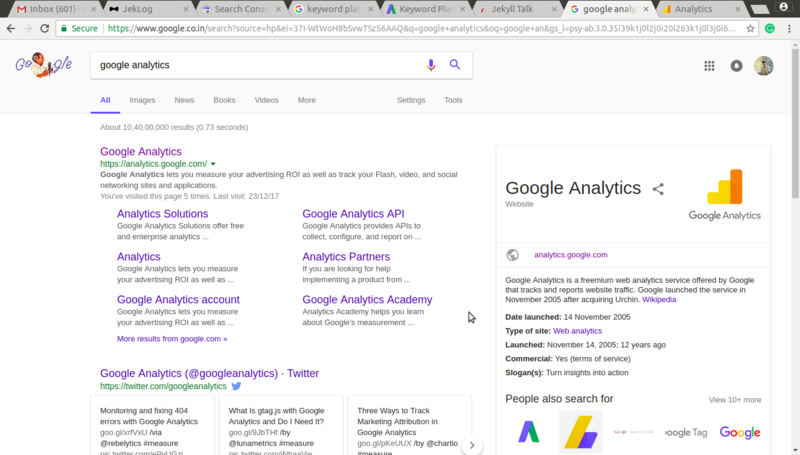 Google is very harsh to the unethical way or the black hat SEO techniques. If you are found guilty on any of there law, they will send your content to some position which is certainly not is the first ten or so. After that, they will not allow you to come back until all the wrongs are undone. Mostly, it takes years to fix. I myself have a rule of thumb never try a black hat mean to get search engine traffic. Black hat method does have some profits in the near future but they are bad in the long runs. Mobile friendliness is one of the most important needs of today’s generation SEO. More than the half of the leads these days are generated using mobile phones. The theme that we are using on our JekLog website for the blogs is a mobile-friendly theme. Google now ranks the mobile-optimized websites higher than the websites that are not optimized for the mobile phones. This is a great way to increase the search engine traffic. Headings and URL’s are the most important places where you can put your keywords to make them visually stand out. This will help the crawlers to index your site properly and for the same keywords that you want them to stand out by themselves. We have talked a lot about theory, it’s time for some practical actions. 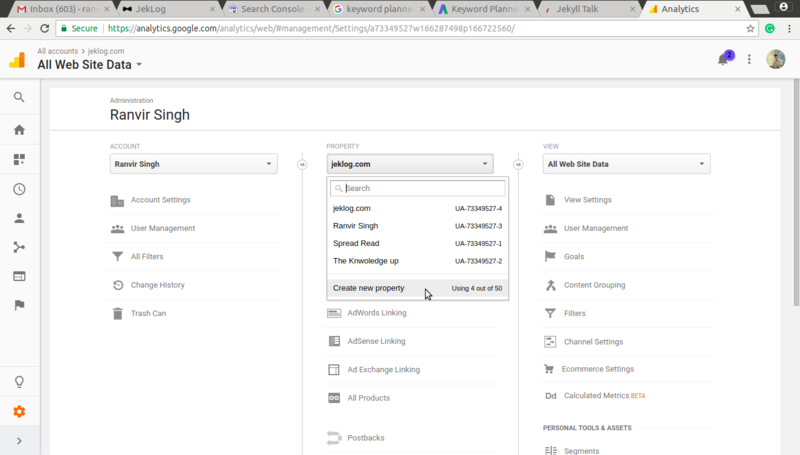 I hope you have a blog created using JekLog and now you want Google to index or rank your website/blog. 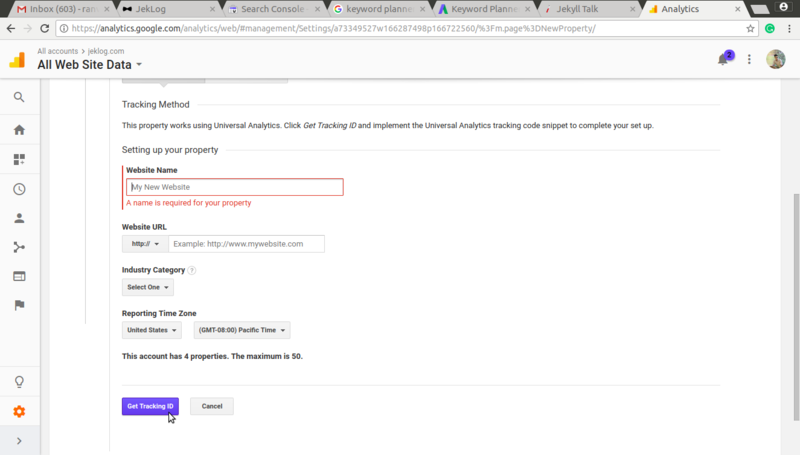 First of all, You need to go to the Google Analytics website to find the Google tracking ID. Go to the admin panel after logging in to the website. Create a new property to add a new website to the list. Now add the relevant details of the website to get the tracking ID. 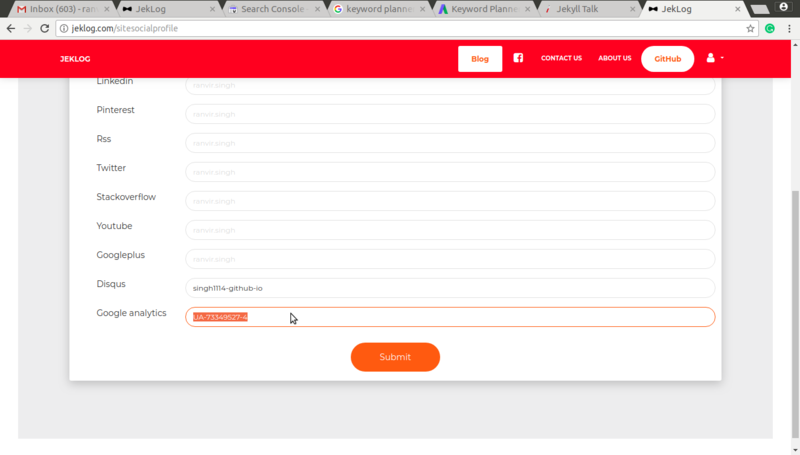 Choose the “Connect social sites” option on the JekLog website. After this, Add the google tracking ID to the given box. Now go to the google search console website, add your website and click on verify. The website is already verified using the tracking ID. Nothing else is needed to do. Now you can wait for sometime and you will start getting search engine traffic. Do share your views using the new commenting system that we have installed using disqus. Have a great day!